ww2dbaseWerner Mölders was born in Gelsenkirchen, Westphalia, Germany to teacher Viktor Mölders and Annemarie Mölders (née Riedel) as the third of four children. The elder Mölders was a reserve junior officer in the German King's 145th Infantry Regiment; he was killed in action on 2 Mar 1915 in the Argonne Forest in France during WW1. Upon his father's death, Mölders' mother moved the family into her parents' home in Brandenburg an der Havel, Brandenburg, Germany. He enjoyed water sports, thus was a member of two rowing clubs successively. He graduated from Saldria Gymnasium in 1931 and then joined the German Army in Allenstein, East Prussia, Germany on 1 Apr 1931 as an officer cadet of the II./2 Infantry Regiment. In Oct 1932, he completed his initial military training, and then attended the military school in Dresden, Germany, completing his studies on 1 Jun 1933, upon which event he was promoted to the rank of Fähnrich. Now a member of the 1st Prussian Pioneer Battalion in the same regiment, he was sent to the Pioneer School in Munich, Germany for further studies. It was around this time that he wanted to become a pilot. Initially, he was declared unfit for flying as he tended to become motion sick and vomit in flight, but he was able to secure conditional permission to begin pilot training. Between 6 Feb and 31 Dec 1934, he received military pilot training in 1934 at the Deutsche Verkehrsfliegerschule in Cottbus, Germany; during that time, on 1 Mar, he was transferred into the German Air Force, Luftwaffe. Between 1 Jan and 30 Jun 1935, he received fighter pilot training in Tutow and then Schleißheim, Germany; he was certified a pilot of the Luftwaffe on 21 May 1935. On 1 Jul 1935, he was posted to I./JG 162 "Immelmann"; with this unit, he flew missions over the Ruhr region of Germany during the German remilitarization of Rhineland, becoming among the first German airmen to arrive in Düsseldorf, Germany. Promoted to the rank of Oberleutnant on 20 Apr, he was named the commanding officer of a training squadron in the 2nd Group of Jagdgeschwader 134 "Horst Wessel", which was under the command of Theodor Osterkamp. On 15 Mar 1937, he was named the squadron leader of the 1st Squadron of Jagdgeschwader 334.
ww2dbaseDuring the Spanish Civil War, Mölders was a volunteer member of the Condor Legion that was dispatched to Spanish to fight on the side of the Nationalists. Arriving in Spain in Apr 1938, he was assigned to the 3rd Squadron of Jagdgruppe 88 under Adolf Galland, flying first He 51 and alter Bf 109 B-2 fighters; in May, he became the squadron commander. He scored his first victory, an I-15 fighter, near Algar, Spain on 15 Jul 1938; he would soon become the leading ace of the Condor Legion with 14 confirmed kills (out of 15 claimed). For his service, the Spanish military later awarded him the Medalla de la Campaña and the Medalla Militar. Returning to Germany on 5 Dec 1938, he was a member of the 1st Group of Jagdgeschwader 133 between 6 Dec 1938 and Mar 1939; part of that time also held a staff position with the Inspector of Fighters office in the Air Ministry in Berlin, Germany to develop fighter tactics. During the Jun 1939 state banquet at the Reich Chancellery in Berlin to honor the victory in Spain, he was seated at the first table alongside of high ranking German and Spanish officers, including General Hugo Sperrle. ww2dbaseEarly in the European War, Mölders was stationed in western Germany near the French border. He was injured in a crash landing incident on 8 Sep, injuring his back, but he returned to action 11 days later. On 20 Sep, he scored his first kill of the European War between Contz and Sierck in northeastern France; the victim was Sergeant Queginer's P-36 fighter of Groupe de Chasse II/5 of the French Air Force. He earned the Iron Cross 2nd Class medal as the result of this first kill. In late Sep 1939, he was named the commanding officer of III./JG 53. On 22 Dec, between Metz and Thionville in France, he and fellow pilot Hans von Hahn shot down two Hurricane fighters, becoming the first German pilots to do so. He would achieve 9 victories before the German invasion of France. ww2dbaseDuring the German invasion of France, Mölders' was shot down on 14 May over Sedan, France, but he was able to bail out and avoid injuries. He went on to score two victories on 27 May, leading to him being the first fighter pilot to receive the Knight's Cross of the Iron Cross award. On 5 Jun at about 1840 hours, he was shot down again near Compiègne, France by French pilot René Pomier-Layrargues in a D.520 aircraft; he bailed out successfully, but was captured on the ground, becoming a prisoner of war for the following three weeks. He met Pomier-Layrargues while in captivity, who would be killed in action on the same day of their meeting. During his captivity, he had his Knight's Cross medal stolen by a French guard, but the officer Capitaine Giron located the stolen medal and returned it to him. After he was freed, a guard who had mistreated Mölders was sentenced to death; Mölders requested Luftwaffe chief Hermann Göring for clemency for the guard, which was granted. ww2dbaseMölders returned to Germany in Jul 1940. As the commanding officer of the fighter wing JG 51, he flew his first combat sortie in the Battle of Britain on 28 Jul; on this mission, he engaged in a dogfight against the Spitfire fighter piloted Flight Lieutenant J. L. Webster of the Royal Air Force, which kept him out of action for a month. On 28 Aug, he lost his wingman Oberleutnant Kircheis in combat, who was shot down and was captured; Oberleutnant Georg Claus was chosen to be the new wingman. On 5 Oct 1940, his younger brother Victor Mölders, also a fighter pilot, was shot down and was captured. On 20 Sep, he shot down two Spitfire fighters of No. 92 Squadron RAF, becoming the first fighter pilot to achieve 40 victories, and was awarded Oak Leaves to his Knight's Cross of the Iron Cross medal on the following day for this feat; this medal was awarded personally by Adolf Hitler at the Reich Chancellery in Berlin, Germany. He was promoted to the rank of Oberstleutnant in late Oct 1940 after achieving 50 victories, but was kept out of action due to severe influenza; while he was off the active duty roster, his wingman Georg Claus was killed in action over the Thames River in England, United Kingdom. His final victory claim of the year was scored on 1 Dec 1940. He and fellow members of JG 53 were given a break in late Dec, skiing in southern Germany in the Vorarlberg region that would be returned to Austria after the war. In Jan 1941, Mölders was assigned Oberleutnant Hartmann Grasser as his new wingman as he returned to combat in France. ww2dbaseMölders was well-liked by his men for that he was known to be always mindful of the welfare of those under him. He also ensured that captured enemy airmen kept under his command were treated fairly. Günther Rall, WW2 ace and future chief of staff of the post-war Luftwaffe, would recall Mölders as "a marvelous tactician. My admiration for him was boundless. He had a great wit and great personality. He was the most highly principled man I ever met." ww2dbaseIn Jun 1941, Mölders was transferred to the soon-to-be-opened Eastern Front. On 22 Jun 1941, the opening day of Operation Barbarossa, he shot down three SB bombers and one Hawk fighter, which would earn him Swords to his Knight's Cross, once again personally presented to him by Adolf Hitler. On 30 Jun, he shot down three Soviet bombers, bringing his total victory count to 82, which surpassed the record of 80 set by Manfred von Richthofen, "Red Baron", during WW1. He reached the 100 kills milestone on 15 Jul 1941, which led to the award of Diamonds to his Knight's Cross; he was the first pilot in the world to achieve 100 kills. On 20 Jul 1941, he was promoted to the rank of Oberst and was transferred to Berlin. ww2dbaseMölders was named the Inspector General of Fighters in the Luftwaffe High Command on 7 Aug, making him responsible for ongoing tactical and operational doctrine. In Sep 1941, he set up a command post at Chaplinka airfield in Ukraine, from which he would fly his personal Fi 156 Storch aircraft to visit various fighter airfields near the front. Although officially barred from flying combat missions, he secretly went on several more over the next few months; it was estimated that he shot down about 30 Soviet aircraft during this time, but none of those would appear on official records. ww2dbaseOn 22 Nov 1941, Mölders traveled as a passenger aboard a He 111 aircraft from Ukraine to Germany to attend the funeral of Ernst Udet. En route, the aircraft crashed at Breslau, Poland during landing in a thunderstorm, killing Mölders as well as the pilot Oberleutnant Kolbe and flight engineer Oberfeldwebel Hobbie. Investigators found that his back and many ribs were broken, and hypothesized that he might have survived the crash had he fastened his seat belt. His unit, Jagdgeschwader 51, was christened "Mölders" in his honor within hours of his death. A state funeral was held at the Reich Air Ministry in Berlin on 28 Nov with Hermann Göring delivering the eulogy. He was buried next to Udet and Richthofen at the Invalidenfriedhof in Berlin. 18 Mar 1913 Werner Mölders was born in Gelsenkirchen, Westphalia, Germany. 1 Oct 1925 Werner Mölders joined the Catholic youth organisation Bund Neudeutschland. 1 Apr 1931 Werner Mölders joined the German Army as an officer cadet. 1 Apr 1932 Werner Mölders was promoted to the rank of Fahnenjunker-Unteroffizier. 1 Jun 1933 Werner Mölders was promoted to the rank of Fähnrich as he graduated from the Dresden military academy. 1 Feb 1934 Werner Mölders was promoted to the rank of Oberfähnrich. 6 Feb 1934 Werner Mölders began receiving basic flying instructions at the Deutsche Verkehrsfliegerschule in Cottbus, Germany. 1 Mar 1934 Werner Mölders was promoted to the rank of Leutnant; he also transferred to the Luftwaffe on this date. 31 Dec 1934 Werner Mölders completed basic flying training at the Deutsche Verkehrsfliegerschule in Cottbus, Germany. 1 Jan 1935 Werner Mölders began receiving fighter pilot instructions at the flying school in Tutow, Germany and the Jagdfliegerschule near Munich, Germany. 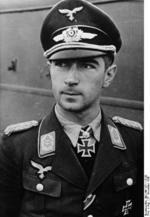 21 May 1935 Werner Mölders received the Pilot's Badge of the Luftwaffe. 30 Jun 1935 Werner Mölders completed fighter pilot training at the flying school in Tutow, Germany and the Jagdfliegerschule in Schleißheim, Germany. 1 Jul 1935 Werner Mölders was posted to I./JG 162 "Immelmann". 7 Mar 1936 Werner Mölders flew missions over the Rhineland region of Germany. 20 Apr 1936 Werner Mölders was promoted to the rank of Oberleutnant, effective as of 1 Apr 1936. 2 Oct 1936 Werner Mölders received the Dienstauszeichnung 4th Class award. 15 Mar 1937 Werner Mölders was named the squadron leader of the 1st Squadron of Jagdgeschwader 334. 14 Apr 1938 Werner Mölders arrived in Cádiz, Spain by sea. 24 May 1938 Werner Mölders became the commanding officer of the 3rd Squadron of Jagdgruppe 88 in Spain. 15 Jul 1938 Werner Mölders scored his first aerial victory near Algar, Spain; the victim was an I-15 fighter. 18 Oct 1938 Werner Mölders was promoted to the rank of Hauptmann, effective as of 1 Oct 1938. 3 Nov 1938 Werner Mölders scored his final aerial victory in the Spanish Civil War. 5 Dec 1938 Werner Mölders returned to Germany from Spain. 6 Dec 1938 Werner Mölders was assigned to the 1st Group of the Jagdgeschwader 133. 4 May 1939 Werner Mölders was awarded the Medalla de la Campaña and Medalla Militar by Spain. 6 Jun 1939 Werner Mölders was awarded the German Spanish Cross in Gold with Swords and Diamonds. 8 Sep 1939 Werner Mölders crash landed his fighter aircraft after developing engine trouble; his back was injured, which kept him out of action for 11 days. 20 Sep 1939 Werner Mölders scored his first kill of the European War; the victim was a P-36 fighter. For this victory, he was awarded the Iron Cross 2nd Class. 26 Sep 1939 Werner Mölders was relieved of his duty as the commanding officer of 1./JG 53 as he was named the commanding officer of III./JG 53. 22 Dec 1939 Werner Mölders and Hans von Hahn became the first German fighter pilots to shoot down British Hurricane fighters. 2 Apr 1940 Werner Mölders shot down Flight Lieutenant C. D. Palmer's Hurricane fighter of No. 1 Squadron RAF. On this date, he also received the Iron Cross 1st Class award. 20 Apr 1940 Werner Mölders shot down a French P-36 fighter near Saarbrücken, Germany. 14 May 1940 Werner Mölders was shot down over Sedan, France, but was able to bail out to safety. 27 May 1940 Werner Mölders claimed his 19th and 20th victories southwest of Amiens, France; the victims were both P-36 fighters. 29 May 1940 Werner Mölders was awarded the Knight's Cross of the Iron Cross, the first fighter pilot to receive this award. 5 Jun 1940 Werner Mölders was shot down by French pilot René Pomier-Layrargues near Compiègne, France; he bailed out to safety but was captured by the French. He would be released later upon the French armistice. 19 Jul 1940 Werner Mölders was promoted to the rank of Major. 28 Jul 1940 Werner Mölders flew his first combat sortie in the Battle of Britain; he sustained injuries after being hit by RAF Flight Lieutenant J. L. Webster over Dover, England, keeping him out of action for a month. 7 Aug 1940 Werner Mölders returned to duty without receiving medical clearance. 28 Aug 1940 Werner Mölders' wingman Oberleutnant Kircheis was shot down and became captured; Oberleutnant Georg Claus took over as his new wingman. 31 Aug 1940 Werner Mölders claimed two victories against British Hurricane fighters. 20 Sep 1940 Werner Mölders shot down two Spitfire fighters of No. 92 Squadron RAF near Dungeness, England, United Kingdom, which were the 39th and 40th victories. 21 Sep 1940 Werner Mölders was awarded Oak Leaves to his Knight's Cross of the Iron Cross medal for being the first fighter pilot to achieve 40 victories. 23 Sep 1940 Werner Mölders was presented Oak Leaves to his Knight's Cross medal by Adolf Hitler in Berlin, Germany. 11 Oct 1940 Werner Mölders claimed his 43rd victory over Canterbury, England, United Kingdom. 12 Oct 1940 Werner Mölders shot down three British Hurricane fighters over England, United Kingdom, bringing his total kills count to 51. 20 Oct 1940 Werner Mölders was promoted to the rank of Oberstleutnant. 22 Oct 1940 Werner Mölders claimed his 50th victory. 29 Oct 1940 Werner Mölders claimed his 54th victory. 1 Dec 1940 Werner Mölders claimed his 55th victory. 10 Feb 1941 Werner Mölders claimed his 56th victory. 26 Feb 1941 Werner Mölders claimed his 60th victory. 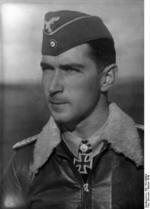 22 Jun 1941 Werner Mölders shot down three Soviet bombers and one fighter; he was awarded Swords of his Knight's Cross, to be presented to him by Adolf Hitler on 3 Jul. 30 Jun 1941 Werner Mölders shot down three Soviet bombers, bringing his total score to 82 victories and surpassing the record set by Manfred von Richthofen, "Red Baron", during WW1. 3 Jul 1941 Werner Mölders was presented Swords to his Knight's Cross by Adolf Hitler. 12 Jul 1941 Werner Mölders reported that under his command JG 51 had destroyed 500 Soviet aircraft at the cost of only three casualties during the first 20 days of Operation Barbarossa. 15 Jul 1941 Werner Mölders claimed his 100th and 101st victories over the Soviet Union. He was awarded Diamonds to his Knight's Cross for achieving 100 victories, which was to be presented later by Adolf Hitler personally. 20 Jul 1941 Werner Mölders was promoted to the rank of Oberst and was transferred to the Reich Air Ministry in Berlin, Germany. 25 Jul 1941 Werner Mölders traveled to the Wolf's Lair at Rastenburg, East Prussia, Germany and met with Adolf Hitler, Wilhelm Keitel, and Hermann Göring. 26 Jul 1941 Werner Mölders was presented Diamonds to his Knight's Cross by Adolf Hitler. 7 Aug 1941 Werner Mölders was named the Inspector General of Fighters of the Luftwaffe. 13 Sep 1941 Werner Mölders married Luise Baldauf (née Thurner), widow of a friend who had been killed in combat. They would have one daughter, Verena, born after Mölders' death. 22 Nov 1941 Werner Mölders was killed during a landing accident while traveling as a passenger aboard a He 111 aircraft. Hours later, Jagdgeschwader 51 was christened "Mölders" in his honor. 28 Nov 1941 A state funeral was held for Werner Mölders in Berlin, Germany. 11 Oct 1991 Werner Mölders' grave site at the Invalidenfriedhof in Berlin, Germany was rededicated.